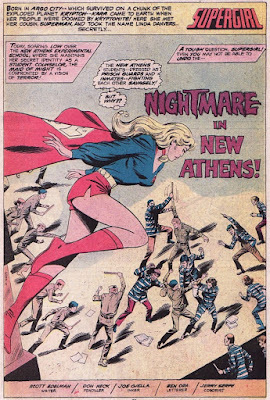 "Nightmare in New Athens" was written by Scott Edelman with art by Don Heck and Joe Giella. 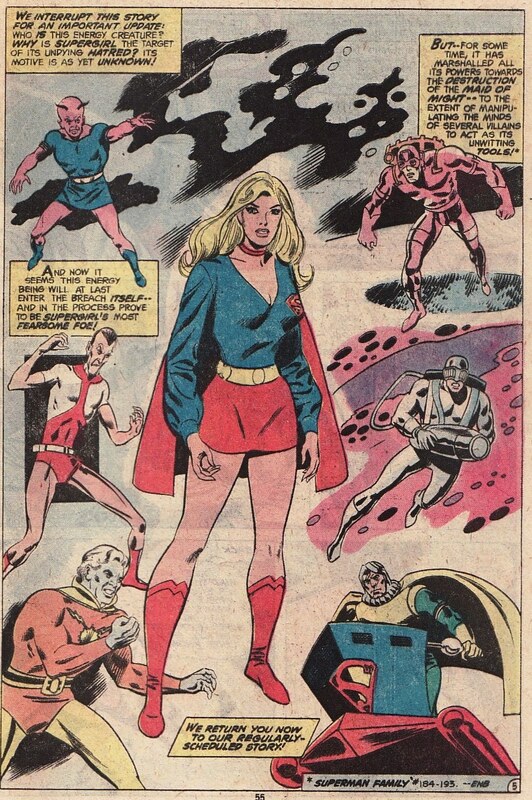 Edelman has very little Supergirl in his background, just this issue and co-writing the Supergirl/Doom Patrol crossover in Superman Family #193. 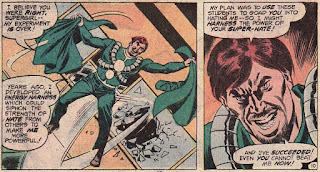 And to be frank, I am just not a fan of Don Heck's art even though this might be one of his better showings in my mind. We open up with a nice splash page of Supergirl flying over the New Athens Experimental School campus where she sees a riot between students. Some are dressed in prison guard uniforms and wielding billy clubs. Others are dressed in prison clothes. And this isn't play fighting. I will say it is a nice opening shot of Supergirl, impossibly leggy. Utilizing some nearby construction equipment, Supergirl builds a wall between the two groups. After all, what makes better sense to keep people out than a wall. Once separated, the two groups seem to calm down. One of the students explains that they all signed up for a sociology experiment where one group would be labeled prisoners and others guards. Once the experiment started, the roles the students were assigned to seemed to take over. They all seemed to lose their heads. And without any dialogue, they simply attack each other. In many ways, that is how the original experiment played out. 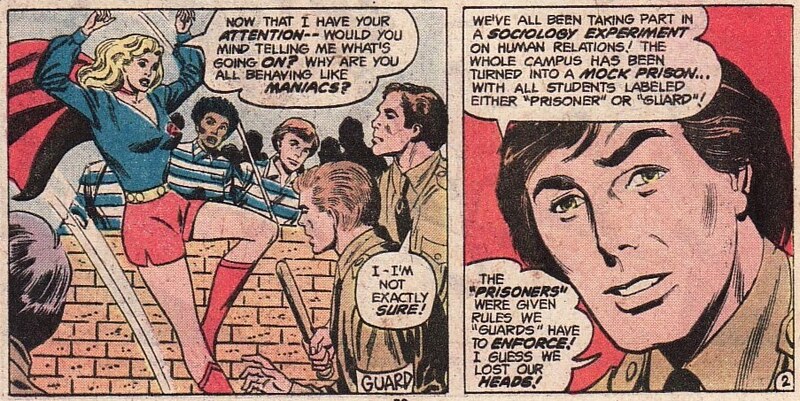 Supergirl ends up meeting Professor Martin, the Sociology professor running the experiment. 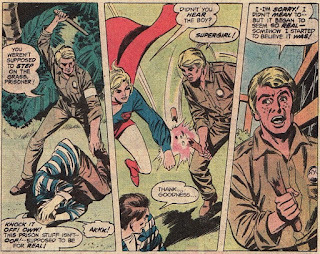 He screams at Supergirl for her interference with the experiment as it was playing out. The students had signed releases. They knew what they were doing. She shouldn't have jumped in. This raises the ire of Supergirl who can't relate to this man who would let children hurt each other in this way. She flies off angrily, much to Professor Martin's delight. The experiment continues on the campus with the groups getting more out of control. One of the guards loses all controls and begins to seriously beat one of the students, laying into him with the billy club for the offense of walking on the grass. 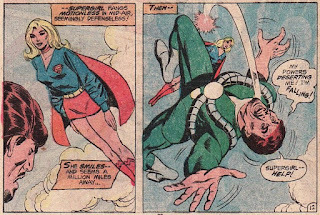 Supergirl flies in and stops the attack. And once broken out of his reverie, the 'guard' admits he began to think the experiment was real. Again this mirrors the real attack. But it was simply that this 'prisoner' was something different that made this attack possible. He was labeled with one word and therefore was hated. At this point Supergirl decides that it is time to end the experiment once and for all. She goes to find Martin. When she interrupts his class lecture, also on the topic of how hate will always exist, he decides he will take matters into his own hands. 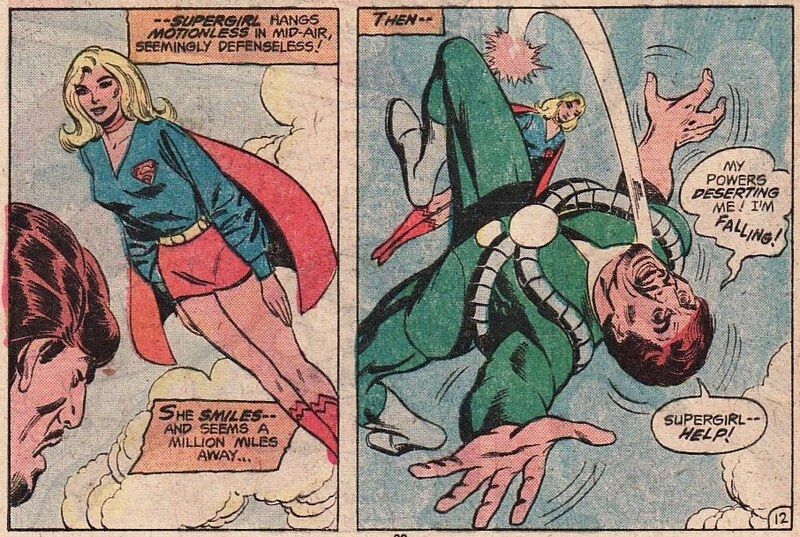 And somehow he is able to punch Supergirl hard enough to send her flying. Well, it turns out that Martin has built a device which absorbs hate and converts it into strength. He created the Prison Experiment to feed on the hate he would instill in the students. But Supergirl's hate of him and his methods has been like drinking right from the tap. He is flooded with super-hate and therefore super-energy. Someone energized by hate! I see this every day in the news on all sides! Initially Supergirl can't beat Martin. Her own hate and anger continues to seethe and feed Martin. But then, in the middle of the episode, she seems to calm down. Serene and smiling, she floats hear Martin as his powers seem to fade. Then, on the way down she cuffs him in the face and knocks him out. It is clear that this calm focus is what depowered Martin but what really happened? Supergirl realized that she couldn't help but feel some hate towards Martin. So she needed to clear her thoughts. Using self-hypnosis, she made herself believe she was playing catch with Superman, tossing giant meteors to each other. Without hate to feed his engine, Martin simply loses powers. 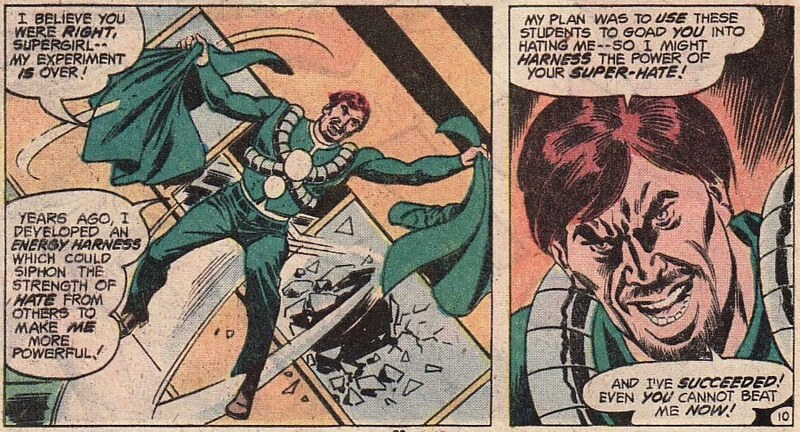 And the punch to his face was that image of Kara tossing the meteor. It was only with love that she could defeat his hate. Okay, so this was a simple solution to the problem. But I like the sentiment. 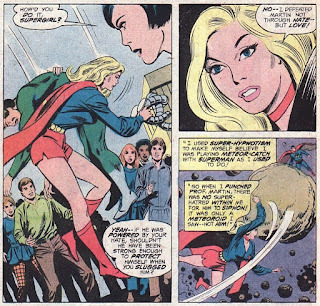 While not part of this main story, there is the subplot of the disembodied force conspiring against Supergirl. 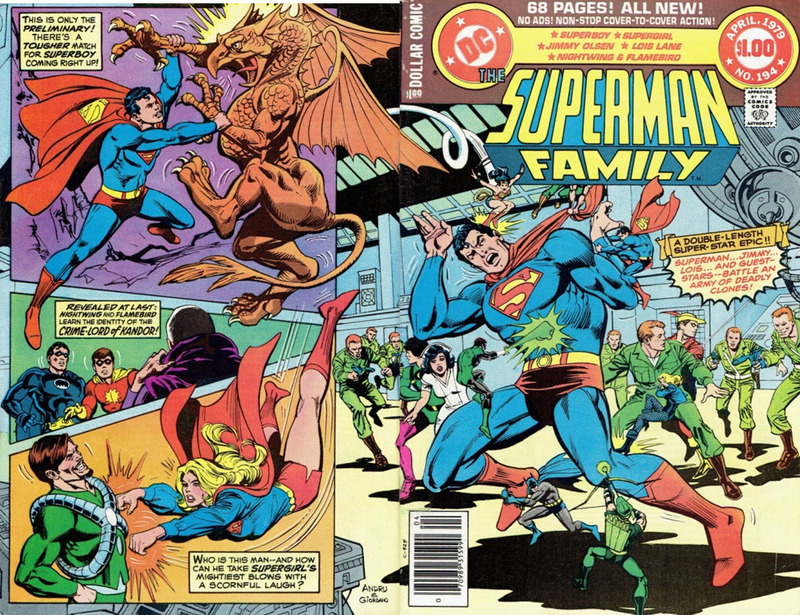 In this issue, it ends up possessing a Superboy robot. I did like how in this book, there was an ongoing subplot rather than simply one-and-done stories. As we learn later, this was the disembodied spirit of Lesla Lar trying to get her revenge! 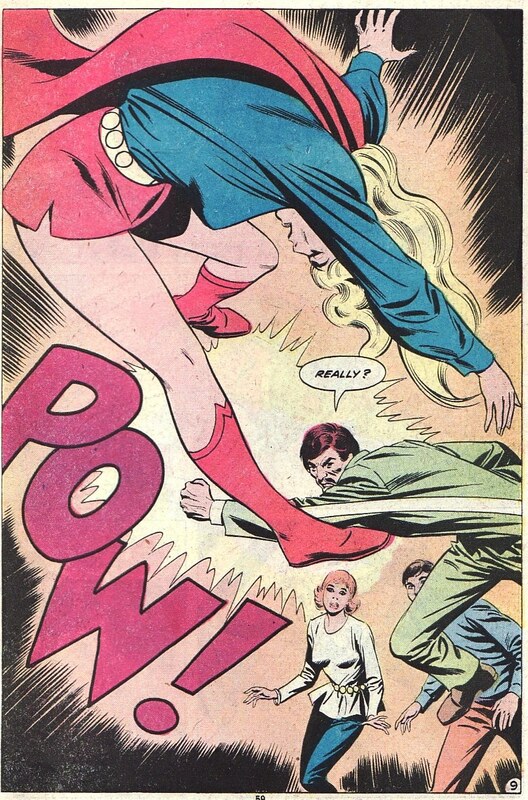 I thought this was a nice splash by Heck and probably the best I have seen him render Supergirl. Nothing too special about this to seek it out from a Supergirl collection viewpoint. But I thought I would cover it and how it seemed to resonate a little more with me in these times. The story is somewhat corny, but not more than usual in comics, and it's funny. I wasn't a fan of Heck's art when I read The Avengers, either. It never grabbed me. It's nice when an enemy forces the Super-cousins to use their brains instead of their fists, and they prove they don't depend on their inhuman strength... even if Kara had to resort to use another weird Pre-Crisis Kryptonian power. Super-hypnotism. Heh. Those powers have always annoyed me! Super-breath was kind of absurd: OK Superman can blow air with incredible power, but freeze stuff? Why on Earth? Bizarro freezing vision made more sense! I read somewhere years ago that, scientifically speaking, freezing breath actually makes more sense than their other powers. I don't remember what the reasoning was, though. Honestly, I don't care. Freezing breath is an awesome and visually cool (sorry) power, and I have a harder time buying "super-ventriloquism" than this. If I begin questioning how it works then I begin questioning how all powers work and the whole, entertaining fantasy falls apart and stops being enjoyable. Trying to reason them out or making up a "realistic" explanation isn't good either because most of "explanations" are nothing but impressive-sounding pseudo-science babble. 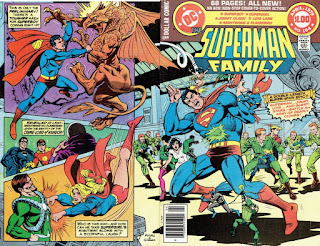 Like John Byrne telling Superman's X-Ray vision is in reality a combination of his microscopic and telescopic visions. Some JB fans think it is an awesome explanation because it is "realistic", when it's physically impossible. So, yes. As long as it doesn't break my Suspension of Disbelief, I don't care. Maybe mine is easily appeasable because I don't get why other people are so fussed about Silver Age SM and SG's having a "myriad" of "powers". Most of them weren't powers but both cousins prefixing anything (sewing, mathematics) with "super-". 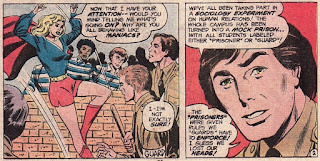 Milgram 137 (The Stanford Experiment) wasn't public knowledge right away, so that's likely why the comic was implementing something that had happened years before. Indifferently drawn, Joe Giella did the best with what he was given in pencils, but there is something sweetly ineffable about Supergirl conjuring up a "Petra Pan Happy Thought" and disarm an opponent instantly. The "Lesla Lar Memorial Disembodied Blob" plot line sadly went nowhere...but at least Scott Edelman tried to nudge it along as best he could. I don't mind silver gen powers. Too incredible but fine for the time. I think they said the superstar could compress the air in the lungs making it super cold. And thanks Wayne. You are probably right that the experiment wasn't common knowledge until later.